Bulls and cattle come in a range of shapes, sizes and colors. Cattle come from every continent except for Antarctica. The diversity of breeds allows humans to use cattle for a variety of purposes. In American culture, people use the cattle for food. In India, however, the cow is sacred, and Hindus wouldn't dare eat a cow. Regardless of the uses you may have for cattle, it is important to understand some of the different breeds of cattle and their characteristics. Also, it is important to recognize that no specific breed is superior for all traits important for beef production. Brahman cattle originally came from India, but they are prevalent in the Southwest, including Texas and Arizona, and there are many in Mexico. Brahmans are intermediate in size, the bulls weighing anywhere from 1,600 to 2,200 lbs. and the cows weighing anywhere from 1,000 to 1,400 lbs. Like any bull, Brahmans can be aggressive; however, they typically take on the disposition of their caretakers. Brahmans are highly tolerant of heat because of their short coats and black skin. The British breeds of cattle were brought to the United States in the late 1700s and 1800s. Of all the breeds of British cattle, the three most common today in the United States are Angus (black and red) and Hereford. Compared to other European breeds of cattle, the British breeds are smaller in size and reach maturity earlier; however, these breeds are very fertile and attain higher quality grades. They typically weigh about 1,000 lbs. to 1,100 lbs. The Brangus breed was developed in the United States. The Brangus is a composite breed consisting of three-eighths Brahman and five-eighths Angus. Brangus cattle are polled (hornless) and black in color. The Brangus breed has combined many of the most desirable traits of the Brahman and Angus breeds, including hardiness, heat tolerance, muscularity, early maturity and production of quality beef. The Beefmaster breed was developed in Texas in the 1930s. Beefmaster cattle do not have a typical color standard although they are usually mostly red-colored. 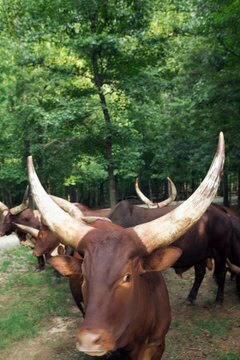 Most Beefmaster cattle have horns. The Beefmaster is a composite breed consisting of one-half Brahman, one-fourth Hereford and one-fourth Shorthorn. This breed thrives under both temperate and severe range conditions. Beefmaster cattle possess many desirable reproductive traits and have high milking potential.